LAS VEGAS – After the final shots have faded away from Monday’s annual SHOT Show Industry Day at the Range at the Boulder City Rifle & Pistol Club, it’s now officially time to kick off the world’s biggest stage for new outdoors, hunting, and shooting gear. That happens on Tuesday morning in Nevada where the 41stedition of the Shooting, Hunting and Outdoor Trade Show begins near the famed casino and hotel portion of the renowned Las Vegas Strip. The 2019 version of the show runs from Jan. 22-25 at the Sands Expo and Convention Center. In the years since the first SHOT Show was held in 1979 in St. Louis, Mo., the annual exposition of new outdoors gear has become one of the biggest such trade shows in the country. That’s understandable given the enormity of hunting and shooting in the U.S., something evidenced by the firearms and ammunition industry being a $6.2 billion-dollar industry in the U.S. in 2017 according to the host organization, the National Shooting Sports Foundation. The NSSF also notes that the total economic impact of the industry is valued at more than $51 billion dollars while supporting some 310,000 jobs. Those trends look very likely to continue since the NSSF says that the 2019 SHOT Show will have more than 1,600 exhibitors on the exhibit floor, a group that will total more than 2,400 when the all-new Pop-Up Preview space is added in. As the largest event held at the Sands Expo and Convention Center, the NSSF reports that the total exhibit space for the 2019 show is expected to be more than 692,000 net square feet, a measurement that is equivalent to nearly 16-acres of space. What’s more, the show has more than 12.5 miles of aisles this year, just a little less than the distance of a half marathon. In one widely quoted statistic from past shows, it’s been said that to see all the booths at the SHOT Show, an attendee can spend only a few minutes in each booth during the show’s four-day long run. With that idea in mind, no wonder there were more than 25,000 downloads of the show’s official app last year! A once-a-year gathering place for manufacturers, wholesalers, retailers, buyers, publishers, media members, and various non-profit groups, the 2019 SHOT Show continues its run of being held in Las Vegas every year since 2010. Overall, this is the 21sttime the SHOT Show has been held in Vegas, more than any other host city. According to the NSSF, last year, the 2018 SHOT Show brought in more than $88 million dollars into the Las Vegas area through non-gaming revenue. That came thanks in part to more than 60,000 professionals in the shooting, hunting, outdoors and law enforcement industry attending. NSSF also notes that the SHOT Show generates millions of revenue dollars necessary to fund many of the organization’s programs and services that help promote, protect and preserve out nation’s hunting heritage, shooting sports, and our 2ndAmendment rights. Some of those programs include the NSSF’s Project ChildSafe, an industry safety education program, as well as Operation Secure Store to help retailers protect against theft and the NSSF’s annual National Shooting Sports Month each August. While hunting and shooting gear have always been a huge part of the massive show, in recent times, the law enforcement portion of the show has grown at a very rapid pace. In fact, in the 16 years since that portion of the show was added, the NSSF says that the show’s law enforcement section has grown from an original 7,000-square feet of space to more than 170,000-square feet today. All told, the NSSF says that the total weight of exhibits at the 2018 gathering exceed more than 7 million pounds being brought in by Freeman, the show’s general services contractor. That includes more than 15,000 firearms (for display on the show floor) being inspected and tagged by the SHOT Show Safety Advisory Team. The 2019 SHOT Show will be widely covered from start to finish in print, on television, on digital platforms, and through social media channels. In fact, the NSSF expects more than 2,400 members of the U.S. and international media to cover the show this year as attendees from all 50 U.S. states and more than 100 other countries attend. That media presence includes Outdoor Sportsman Group, which has assembled a team of more than 100 dedicated professionals who will cover the show and meet with clients throughout the SHOT Show’s week-long run in Vegas. Look for start-to-finish, continuing coverage of the 2019 SHOT Show on a number of OSG digital and print platforms. 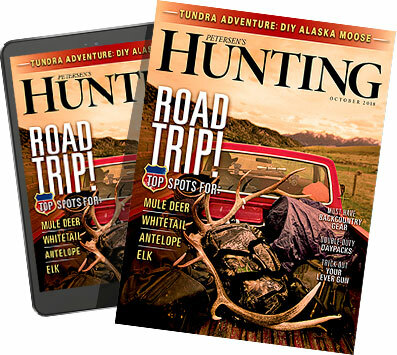 Those include Game & Fish, North American Whitetail, Petersen’s Hunting, Wildfowl, Gun Dog, Guns & Ammo, Shooting Times, Guns & Ammo Handguns, Rifle Shooter, and Firearms News. Also look for show coverage in future Outdoor Channel, Sportsman Channel and MOTV programs thanks to attendance and filming by a number of OSG’s premiere outdoors television show hosts and talent, some of the biggest names in the outdoor industry. And finally, don’t forget to visit OSG’s various social media platforms to find even more wall-to-wall coverage of SHOT Show 2019. The bottom line is that this year’s gathering in southern Nevada promises to be the biggest and the best assembly of the outdoors industry this calendar year as countless new products and services get unveiled here in the Nevada desert. So, if you’re not in Vegas attending this week’s big gathering, tune into OSG platforms all week long for the biggest and the best coverage of SHOT Show 2019!